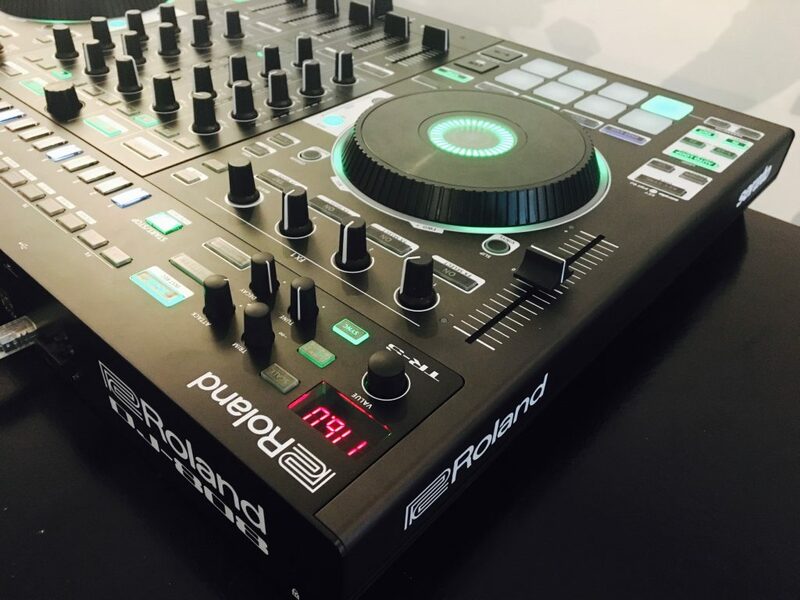 What do you get when you combine Roland and Serato? Well, a little bit of everything, it turns out. The flagship DJ-808 is a monster mixer controller sampler step sequencer audio interface drum machine vocoder. (Whew!) Some of its functionality is provided in the hardware itself; some is a control interface to Serato software on a computer. But together, you get a device that is perhaps the most ambitious all-in-one DJ gizmo yet. 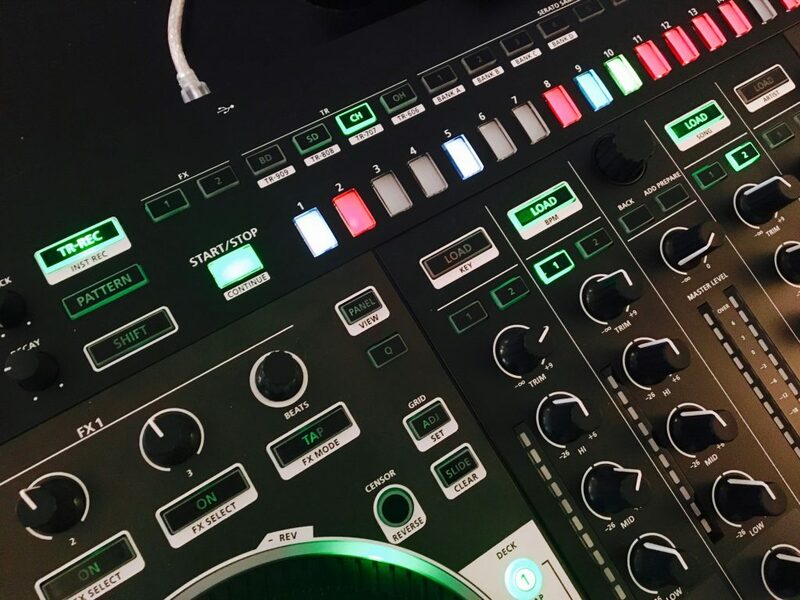 Roland is slapping classic drum machine names and livery all over everything today it seems – even things that seem slightly unrelated, like a 909-themed battle mixer and a turntable. But the DJ-808’s big selling point really is a drum machine – a cousin of the AIRA TR-8 – cross-bred with a DJ controller/mixer. Hardware and software features are intended to work together seamlessly, but it’s helpful to know which is which. Disconnect the computer, and the DJ-808 still does a lot on its own (as in you can yank the actual USB cable out and it’ll keep making sound). The internal drum machine is independent, for example. 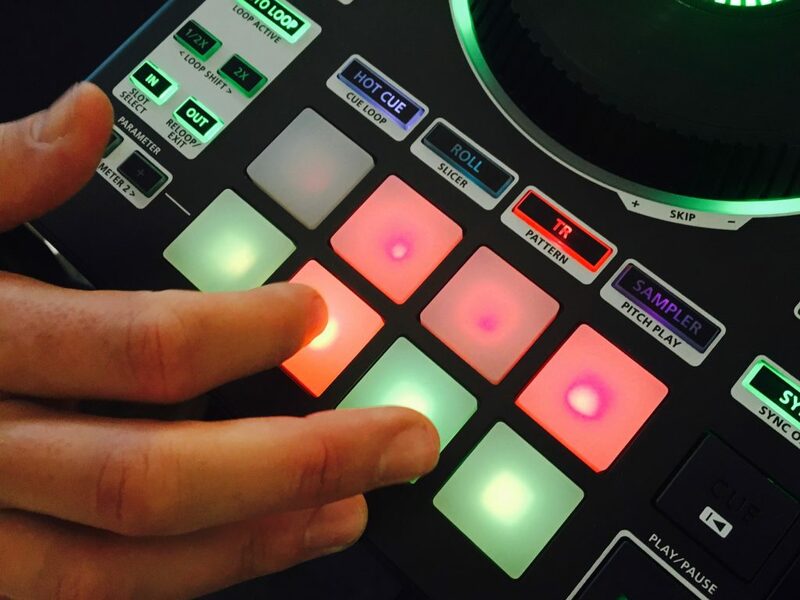 There’s a TR-S – derived from the AIRA TR-8 – built right into the hardware. That gives you all your 606, 707, 808, 909 kicks, snares, claps and hi-hats, modeled and sounding great the same way it does on the AIRA. It has the same Analog Circuit Behavior (ACB) modeling inside, which is … uh, sorry, something I can’t talk about yet, but yes. 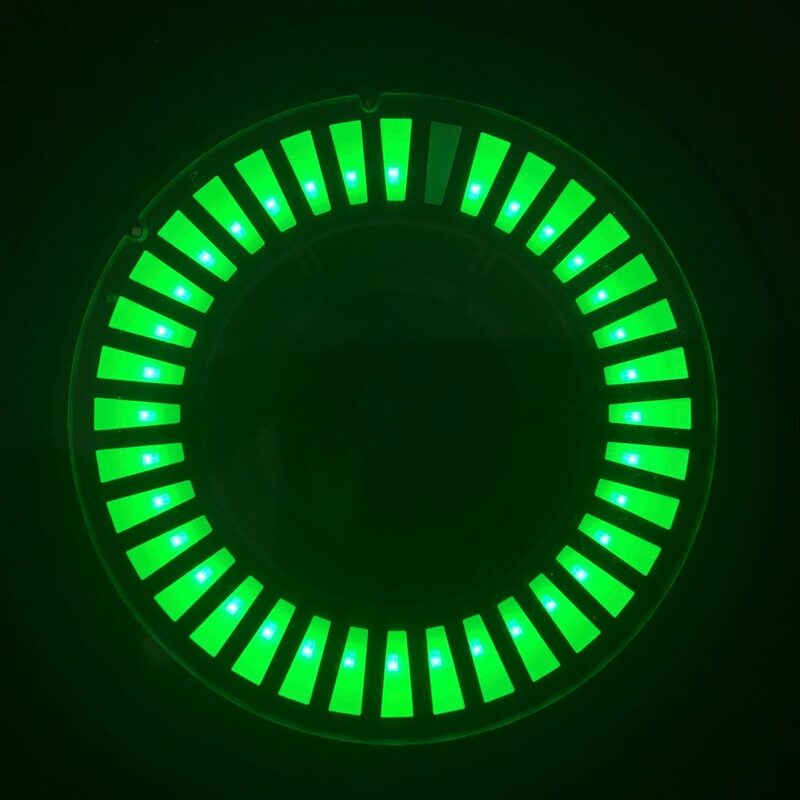 Also inheriting functionality from the AIRA line, you get a VT Voice Transformer. Plug in a mic, and add Pitch, Formant, Ducking, and Reverb. Also, the mixer itself is a full-featured digital mixer, not just an interface to software. You get a 4-channel digital mixer with selectable inputs for 4x PC, 2x Phono/Line and 2x USB/Line. While the controller portion is capable of controlling Serato’s own effects, there are also effects built into the hardware mixer, independent of the computer – Dub Echo, Jet, Noise, and Filter FX. Also, in addition to all the I/O, you’ll find AIRA LINK USB ports. These are special USB host ports that allow you to both sync up and stream audio from other Roland gear. So, for instance, there’s no 303 / bassline on the DJ-808. 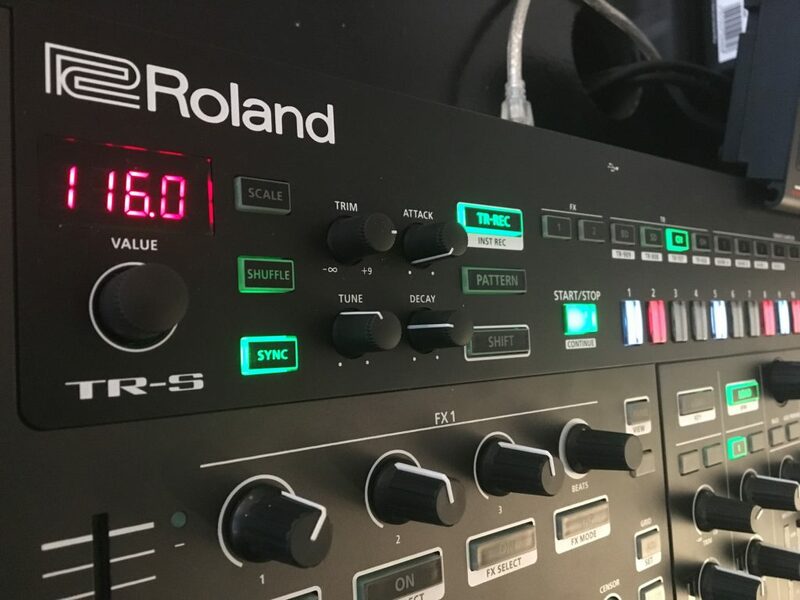 In addition to connecting external gear via audio cable and MIDI DIN, you can connect compatible Roland gear directly via USB with just one cable, and get high-quality streaming and sync. The DJ-808 doesn’t really make sense without Serato, but all of this standalone capability means it still can do double duty in a studio/home in place of other gear. The DJ-808 would be a battleship-sized boondoggle were it not for Serato. And that makes this make sense as hardware in a way it might not have fairly recently. Serato software has made leaps and bounds in functionality like its sampler, pitch and time manipulation, effects, and cues and looping. That changes the value proposition for this as a controller. Obviously, you can find lots of things with knobs and platters. The size, weight, and bulk of something like the DJ-808 means that you really have to want all the extras. Serato’s growth in these areas is good reason to give the DJ-808 a chance. 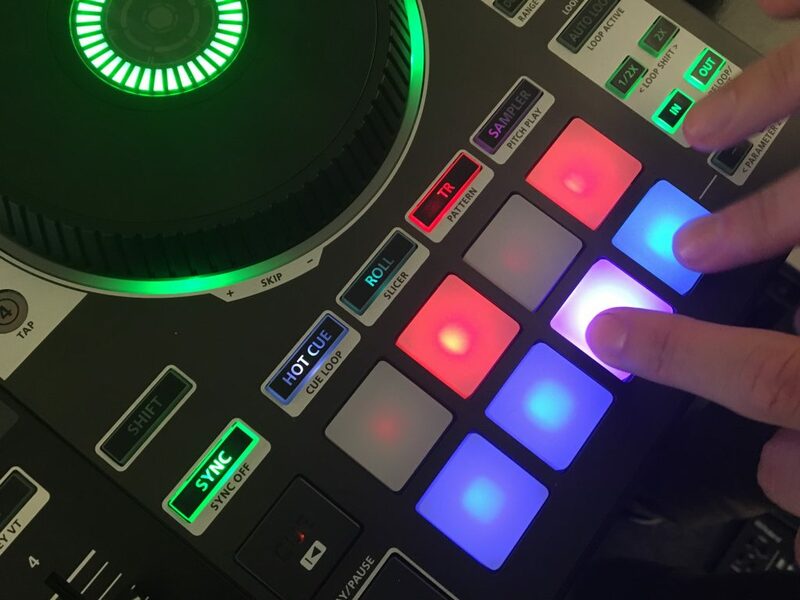 Whereas the similarly-oversized Traktor Kontrol S8 kind of needs you to want to use features like Remix Decks and Stems to take advantage of its default pad mappings, Serato’s sampler features and so on might more easily justify that added controller real estate. So you get not just RGB pads, but velocity-sensitive ones you can genuinely play. The same step-sequencer interface for the TR-S internal sounds also works as a step sequencer for Serato. So the 16 steps, 16 patterns can trigger TR-S sounds, or Serato’s sampler. The step sequencer also works with Serato effects. Also – platters. So, even as NI has gone to touch strips, Serato and Roland stick to the more conventional platters (wheels). These ones are special, too: they feel really great, and you get what Serato terms “ultra high-performance” / “ultra low latency” platters. We’re told they’re the lowest latency of any devices presently on the market, on the order of a couple of milliseconds (or essentially not noticeable). That means the DJ-808 might even appeal to DJs for scratching. There’s even visual feedback, as on a Pioneer CDJ. Of course, if you really want turntablism, you’re going to want turntables, and the DJ-808 is equipped there, too. It’s ready for expansion as Serato DVS. There are other interesting details to the integration. 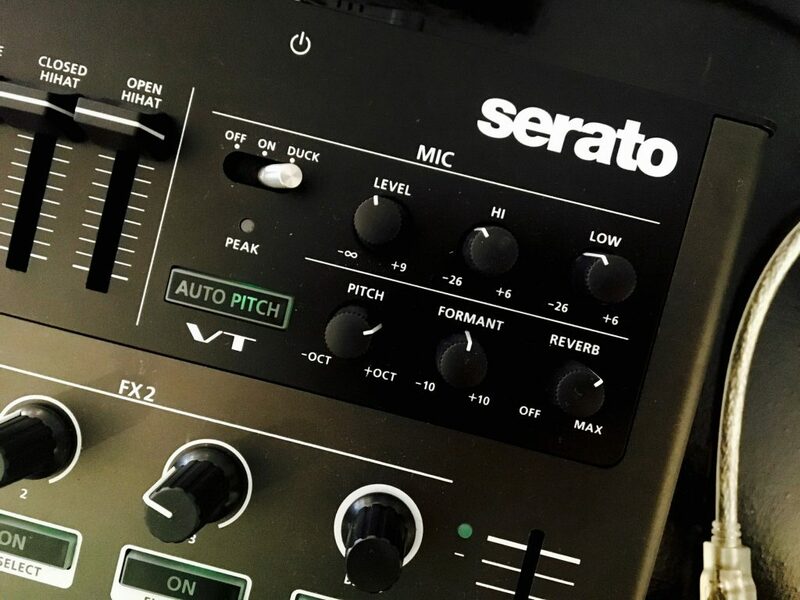 For instance, the DJ-808’s internal VT effects will match pitch to Serato key information – so you can rap/sing/T-Pain your way along and be in the same key as the track you’re playing. There are dedicated Pitch ‘n Time controls too, with Key Sync ‘n Key Shi– uh, sorry Key Sync and Key Shift controls. What there isn’t is any kind of screen. So browsing is still strictly on your computer screen. And this is two deck control, not four. On the other hand, two should be enough given you’re adding things like a drum machine. If you don’t already have a Serato DJ and/or Pitch ‘n Time license, those are in the box, as well. Okay, so it seems we’re back at this point again — somewhere we’ve been with certain Roland grooveboxes of yore and certainly other DJ products. The DJ-808 is something that asked what people wanted (a drum machine! a mixer! an audio interface! a sampler! a DVS! a controller!) — and then gave them, you know, all of it. But there’s still reason it could find a niche. 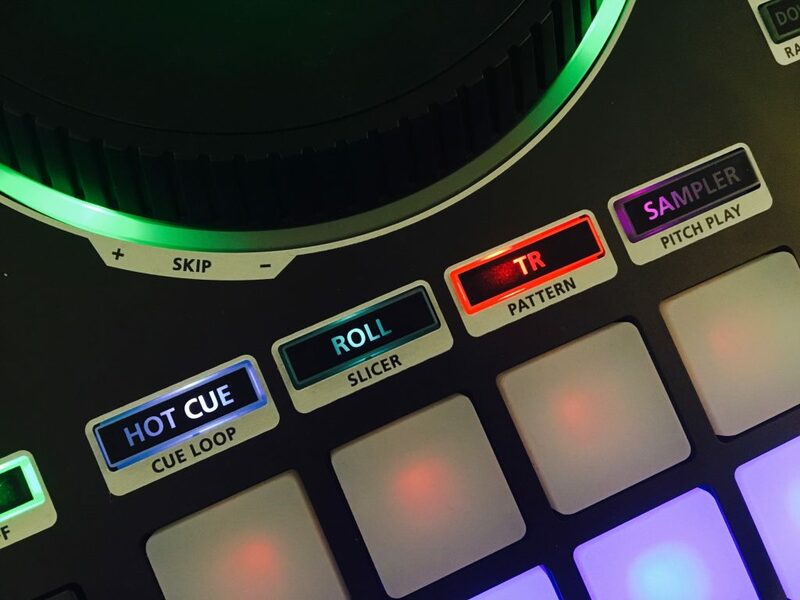 Building the extra functionality around a drum machine and software sampler to me is easier than making a pitch for the cool but more-archaic STEMS and Remix Decks found in Native Instruments’ Traktor. In a home or a studio, if you’re a hard-core Serato power user, this makes sense. Sit it in place once, hook up your turntables and other gear, and the DJ-808 becomes a nice production tool – effects and drum machine all ready to go. Having cautioned that oversized DJ gear isn’t practical in many situations, the DJ-808 does work in any context where a DJ can request a table on a rider. 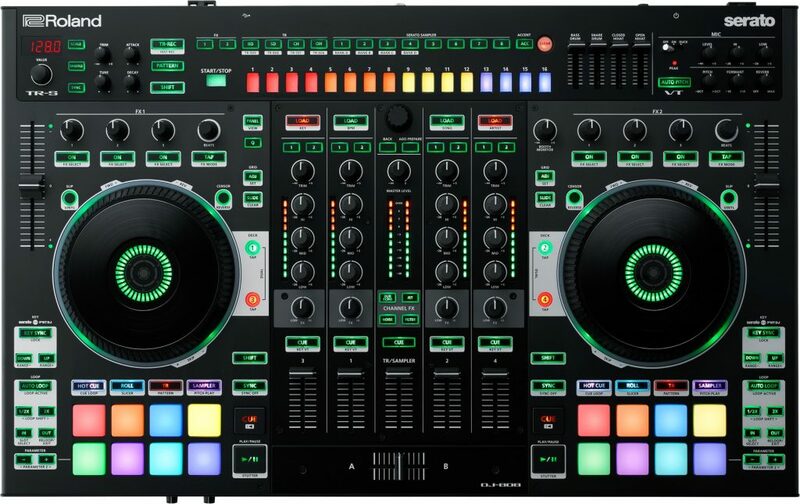 And then the DJ-808’s all-in-one form factor becomes an advantage, not a hindrance — because there’s no gear to connect. That contrasts with Pioneer’s hope that you’ll tote along an extra sampler to the gig. That said, this is all a niche – it’s hard to see a lot of gigging DJs take to something this particular and large. 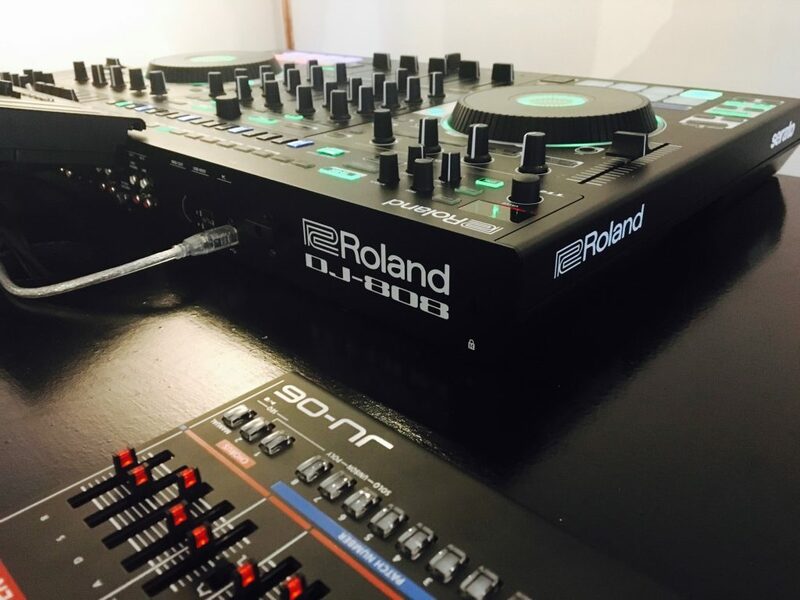 But there’s a lot of innovation in the DJ-808 in terms of low-latency performance and connectivity. And it shows the sort of collaboration on which Roland and Serato might embark. So don’t be surprised if some of the ideas here turn up in other products – this feels a bit like the concept car introducing the range. And still a likable concept car. Sorry, Homer. 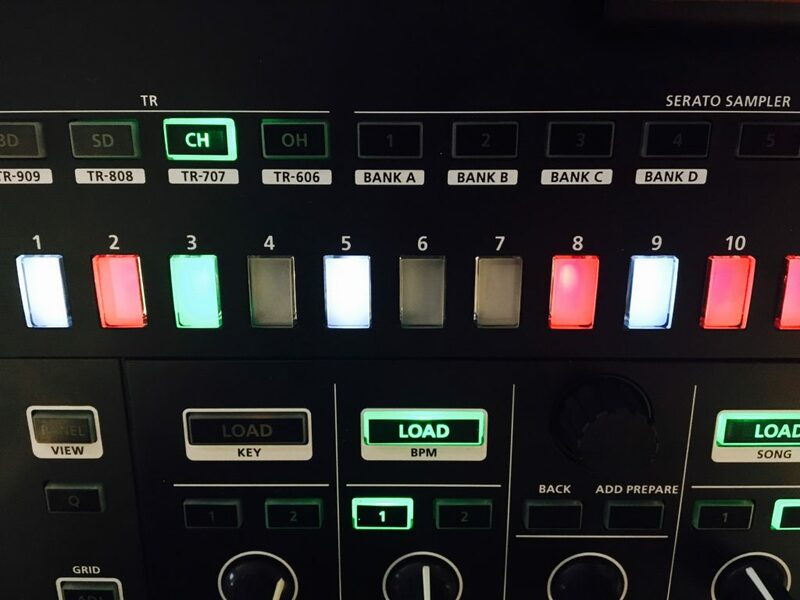 Now, I have to agree with the top DJTT comment — will someone please make a gig-friendly all-in-one that you can easily connect to a mixer? Since it’s not hard to get a mixer added to a rider, it seems what’s really needed is a compact controller with this sort of functionality – then it could keep the laptop compatible with booths.